The epistle begins just after Paul has dismissed the idea of divisions, and he now develops his idea of unity with the image of construction. This all depends on the point Paul has just made (vv. 1-9), that the Corinthians are the possession of God, not their own property. What a farm produces, what use is made of the building as a shelter are all results from the initial conditions of the quality of the soil and the maintenance of the crops, or the quality of the construction of the building. Paul implies that just because the foundation has been well laid, it does not mean that everything above foundation level is of equal quality. Paul has laid the foundation, in the sense that by his initial work Corinthian Christians have come into being. But the foundation is the Lord. Paul describes different kinds of structure because the Corinthian Christians came from the less important social strata but would have seen daily the splendour of luxurious buildings and luxurious pagans. He speaks of the last day. Paul expected at this time that he would live to see the Second Coming of Christ. Paul raises the idea of penalty or approval. This may mean that the reward lies in the fact that a good structure will be preserved. Destruction of a bad piece of work will be punishment. The work may be the teaching of the teachers and leaders of the Church, or the Church itself rising from the foundation of Christ. The teaching is both the building material and the skill with which it is all brought to completion. Paul’s mind always includes as much as much a possible in one integrated meaning. Faith in the foundation of Jesus is the point. Paul comes back to the risks of internal conflict among the Corinthians. This emphasizes that community is sacred. The bigger metaphor is the Temple - Jesus - which when destroyed rose again; and Paul adds the logical point that any destruction results in a divine destruction of the destroyer. 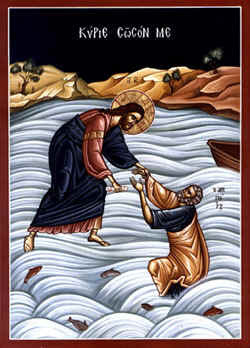 The gospel reading is perhaps the most difficult miracle account of all: walking on the water defies gravity; it is a notorious image for unbelievable behaviour. The reading begins just after the feeding of the 5,000. This shows the concern of Jesus for his disciples’ welfare and for those who had come out to the desert to be healed: he had to send them all the way back home. These severe conditions occur in the Sea of Galilee and can come suddenly. Even for the fishermen, this would have been a trial of strength. But in the dark, it would be more alarming. It was dark, between 3 and 6 in the morning. Imagine men struggling in the dark to keep their vessel upright, after a day which had culminated in the miracle of the dinner in the desert. Their adrenalin is surging; they are frightened; their leader is not with them. And then he is with them – and walking towards them on the sea, although the water is violent. This event resembles the resurrection appearances, and the same elements are present: the fear of the observers who did not expect to see Jesus, and the reassurance from him that he is with them. Matthew is much concerned with the question of faith (Cf. 14: 31; 16: 8; 17: 20), and this episode shows us a changed Peter, re-affirmed as a rock man in terms of his faith after he had been about to sink like a stone, because of his lack of faith. We can imagine that Peter could give no reason why he had doubted; because when he sought for a reason, he had discovered that the main point was greater than reason: it was faith – faith in Jesus himself, constant when all was changeable, permanent when everything seemed to be dissolving. ‘The men in the boat bowed down before him and said “Truly, you are the Son of God”.’ The full meaning has yet to be shown. Bit by bit, event by event, Jesus opens the eyes of faith. ‘Having made the crossing, they came to land at Gennesaret.’ As if one were to say something about a bad day in the North Sea or the Channel: it seems banal, but it expresses relief after a crisis – a crisis of faith. Let us not try to pull to pieces the threads of a sacred garment, but instead to conserve its wholeness so that we may see its value. Jesus is shown as the complete master: he saves. He is the Lord – the Lord of the Church of which Peter will be the first strong defender at Pentecost. But Peter is only strong through faith, and he will fail before the Resurrection (26: 69-75). In his fear of consequences, he will walk away from Jesus. So here, fearing consequences, lacking faith, he begins to sink; and it is his prayer ‘Lord! Save me’ which is always the prayer of the Church. In Job 9: 8, we are told that only God walks on the water; only the complete power of God can subordinate chaos. Only the kingdom, which Jesus will inaugurate finally when he rises from the dead, will extend the divine order of the law of love, the rightful claims of God and the mercy of God, among human beings. Let us enter the ship of faith and say that in John’s gospel the miracles demonstrate that Jesus is God, the Logos incarnate for our salvation. In the other 3 gospels, the miracles demonstrate the mercy of Jesus and his love for people where misery and incompleteness cry out for a remedy, for healing, for a change in the total situation. We have to struggle with the storms of life, but we are not alone. Jesus saves: this is the point by which Paul would direct the minds of all who encountered him to the God of Abraham and Isaac who had appeared in Christ: crucified, risen, and active beyond time and in time, and in our life, now. ‘Lord! Save me.’ If this is our prayer, the answer is always ‘Come’. And we respond to that in faith. No other response makes sense. © Dr. M. R. Brett-Crowther. August 17th 2003.